A – Pointer in the way? Press A to make it disappear and A to bring it back again. H – Change your mind about a hidden slide? Press H to display the hidden slide next in the deck. 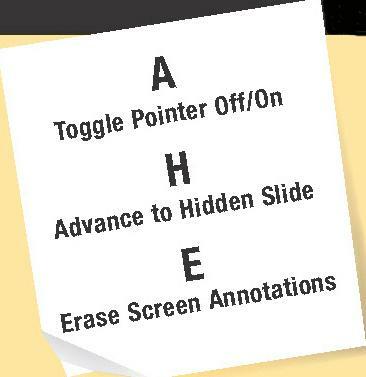 E – Use the Pen or Highlighter marker option to draw on slides? Type E to erase the ink. Why don’t you folk who are interested in keyboards, go to http://www.aeioukeyboard.com? This is the replacement keyboard for all qwerty keyboards. I have just filed a patent for the design.